The parts combine to comprise a solidly made sharpening system for use with bench mounted grinders, either 150mm or 200mm. The parts are coated and coloured black to resist corrosion. An unusual feature is that all the parts are available as individual items, so you only buy what you need. For the test I received: a base for the Kelton sharpening jig, which you can use on the left or right; a multi-grind, which you can use with the long or short arm, and a 'V' block, which again fits both long and short arms and an adjustable table, with stop. The instructions are extremely comprehensive and run to seven pages. My first job was to raise my grinder in order to screw the base support under the centreline of the wide wheel. The base needs to be flat and level with sufficient room at the back to accommodate the carrier arms. The base should be positioned to allow the table to be positioned correctly, allowing for the carrier boss under the wheel. This may be slightly behind the front line of the wheel and may need a trial fitting initially. My grinder has a 200mm wheel but the kit will work just as well with a 150mm setup and the carrier arm bosses are designed to be used either way up in order to lower and raise the component heights. The base support unit is quickly and easily mounted with four screws. In use, the sharpening angles are as always a matter of personal preference. I aimed to replicate the existing angles of the tools sharpened. The tool's existing angles can thereby be used as setup tools. If the current angles of the tools are to be changed, then unless the turner has the experience to find the required settings I would suggest the use of a separate angle jig and a set of profile set up tools - there are various makes and styles of both on the market. Setting the required angles is a matter of trial and error but they can be established with the grinding wheels stationary, moving the tool to simulate the grinding process. The table mounted on a solid 25mm stem, is 114 x 57 x 6mm thick. The table can be arranged at any angle between 90 and 75°. 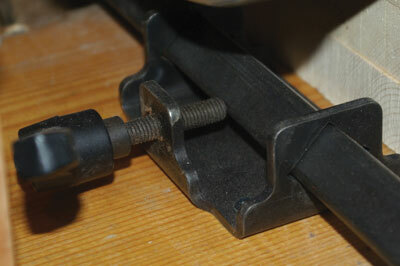 There is also an adjustment screw which helps lock the table in its chosen position. The height of the table can also be adjusted and a central slot maintains a constant angle to the wheel whilst in use. The table was tested using several heavy-duty scrapers with various angles. I found that the simplest way to ensure the existing required angle was replicated was to black out the bevel with a marker pen and check for an even grind mark. I also sharpened two spindle roughing gouges using the table and a similar technique. The stability of the table makes the even grinding of a straight edge simple with my attention being focused on rotating the tools whilst maintaining an even forward pressure. The 'V' block is used in conjunction with the arm carrier(s) in order to provide a stable position for the tool handle whilst sharpening and also to provide a support for the multi-grind. wheel - again using a marker pen -was established, it only took seconds to refresh the grinds. 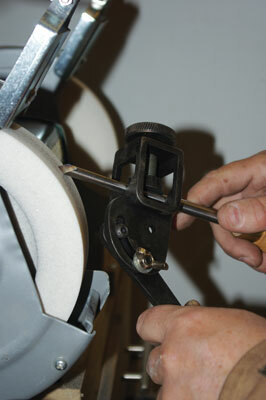 The multi-grind is a clamping frame with an adjustable arm. In use, it pivots in the 'V' block. The tool is clamped in the frame by the downwards pressure exerted by the acetyl covered ball bearing race. 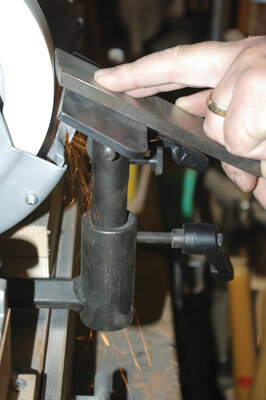 The multi-grind can accept gouges up to 25mm in width, making it suitable for an extensive variation of sizes. Adjustments to the presentation of the gouge can be made in many ways, the height of the 'V' block, the length of the carrier arm projection and the angle of the arm to the multi-grind body. I sharpened several gouges on the multi-grind, my 'normal' projection through the frame being 50mm. For the swept-back gouges, the depth of the swept-back wing can be controlled by the length of the tool's projection from the frame, increasing the projection narrows the depth of the wing and shortening the projection increases it. Simplistically the wings of the grind are controlled by the distance the pivot is away from the wheel and the angle of the tool tip by the angle of the pivot arm itself. To achieve repetitive grinds I suggest you use a depth block(s) on your bench adjacent to the grinder to allow you to easily and quickly set the tool projection through the jig. I also sharpened a spindle gouge using a 50mm projection with the arm facing forwards and this replicated my existing grind almost exactly with just a handful of gentle passes over the wheel. 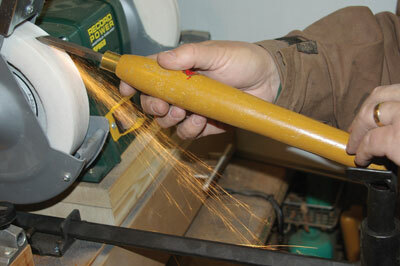 Please do not forget the safety aspects of sharpening and always wear eye protection - a visor is ideal. 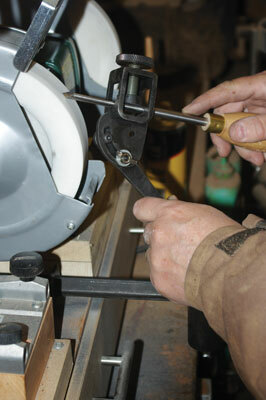 Keep the eye shields in place; don't forget dust protection and consider ear protection in prolonged use. Keep the wheel well dressed and the working area clean and tidy. Do not use the side of the wheels to grind as they are not designed to carry the stress. Always sharpen above the centreline of the wheel. Check that all adjustments are tightened securely to maintain the tool's position and prevent any unwelcome surprises. In fairness, I must declare that I have used other Kelton kit previously and am a long time fan. There was nothing in this kit that would cause me to change that view. The parts, possibly over engineered, are heavily made, well finished, easy to use and should last several lifetimes. If I owned this kit I would open out the slot in the 'V' block stem as it doesn't run through the full length of the support and this means that the locking handle has to be almost fully retracted to remove the holder fully from the boss. That said this is a minor point and easily remedied if required. The system is sold as components so that the buyer purchases only as much, or as little as he/she needs. Many turners may only require one base as they may only have one wheel suitable for using with HSS and and all of the support arms/table can be swapped into the single base, as needed.